Nice presentation, you don’t happen to have a video of the demo available to, say, upload to Google Videos and share it with the rest of us? Sorry, it wasn’t video taped. The talks were audio recorded, but even that isn’t going to help much (except when I was DTracing xmms as it played “Super Freak”). 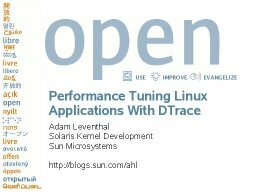 The demos I gave were very roughly a concatenation of what Bryan wrote about demo’ing DTrace and what I wrote about DTrace for Linux.